Rog: Charlie and Stu are 24 and I am 26. Rog: We combine many genres and styles in our music but on the whole, we are an alternative folk/rock band. Charlie: Rog and Stu are brothers and they were born and lived near London. Stuart: Charlie spent a lot of his early years in the USA, living near New York. Eventually, we all went to the same school in Caterham, which is just south of London. Rog: At school, we all played in different rock and punk cover bands but we never all played together during that time, although Charlie and Stu did play together in a rock band, “Empty Search”, for a while. After school we all went to different universities. Charlie was performing as a singer/songwriter and Stu was guesting with a few different bands while I took a break from playing. Charlie and Stu played gigs together as a two-piece acoustic band during vacations. Charlie and Stu had been performing a number of original songs together for quite a while and even made a few live vids. However, they always thought the songs sounded better live than when they recorded them. They decided that they really needed a good bassist – and I was looking to get back into music so I joined them. Rog: We discovered that we needed a new name because Charlie and Stu had been using a name that had already been taken by an older band. We liked “The Narrows” and “The Plains” because we felt they suited our stripped-down acoustic style, but they had also gone. One of us suggested putting them together instead and so we came up with Narrow Plains. Charlie: I am lead vocalist and play acoustic guitar. Roger: I plays bass and sings back-up vocals. We also feature harmonica in some songs. Stu: On our EP, “Somewhere In Between”, Charlie was the main writer as he had already written the basic songs for acoustic guitar while he was a singer/songwriter. Charlie: Stu and Rog helped to re-shape and rearrange them to fit the band format. However, all our newer songs, including the single, “So Rewind/Keep You Anyway”, are joint collaborative efforts. Stu: Not currently although we have had some interest. Ernie: ( Manager of the band ) : Basically, Charlie plays acoustic guitar, Stuart plays drums and Roger plays bass. We can all play other instruments too; Stu and Rog both play guitar; Charlie plays a bit of piano. Charlie: Me and Stu persuaded Rog to join us so we all went to Dorset for a week and transformed, Stu and Rog’s Gran’s house into a temporary recording studio. We spent all day and most of the nights rearranging the songs that I had already written at university and then recorded them. The recording process was a great experience for us all so we have been playing together ever since. Rog: They are really diverse although we all respect the new acoustic/folk movement and we are all fans of bands like Mumford & Sons, Ben Howard, Noah and the Whale and Bon Iver. We also really like Newton Faulkner, and his style of songwriting and guitar playing has definitely influenced Charlie – particularly in the slap technique he uses. We were all influenced by modern American rock music as we were growing up and were (and still are) into bands like Jimmy Eat World, Blink-182 and Foo Fighters. Charlie: We all went to the same school, and played in different bands there. Unfortunately we ended up at different universities but managed to keep playing music whenever we could. We are all interested in music tech, I’m really into video production, Roger likes to keep up to date with environmental issues, and Stuart is a bit of a politics geek! Charlie: Rog and Stu’s Mum worked at a centre for performing arts for disabled people. There was a recording studio there and so they we’re always in and around music. Rog: Charlie and Stuart started playing together whilst at school. 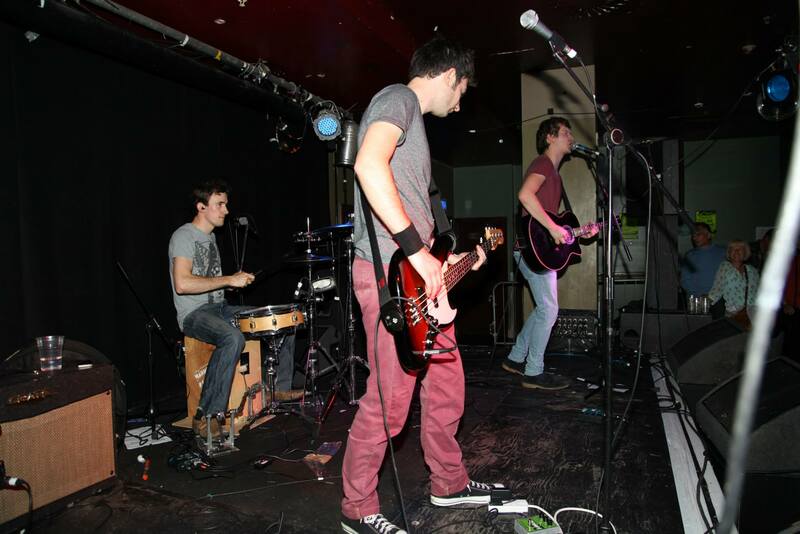 We have all always loved playing to live audiences and we were all in various bands from about 13 onwards. Stu: We have just released a two-track, double A-side single, called ‘So Rewind/Keep You Anyway’. We think this the single shows the changes in our musical style as a band since our debut EP, “Somewhere In Between”. We have written a lot of new songs since the release of the EP with an album in mind. We aim to record the new album at the end of this year/early next year and we are hopeful of securing a recording contract. At our last session, we calculated that we now have at least 18 original songs (including the ones on the EP). We have been playing many of these live at gigs for quite a while. In fact, some of them, like Take Me Back and Let It Die, have become firm favorites at live gigs. Some of the newer ones still need some work though. Stu: The themes in our songs revolve mainly around relationships, past and present – usually girlfriends or friendships. Rog: Charlie will usually come up with a basic structure for a song idea, which we then develop and arrange together. Charlie: We really believe in keeping music simple and genuine. Music for us is about just getting up there and playing so we try to play live as often as possible. We feel our songs reflect this as they are simple and can (hopefully) always be played live almost exactly as they were recorded. Rog: Hopefully we’ll have signed a deal with a record label and eventually be able to tour our music properly. Stu: We would hope that we have recorded the best music that we are capable of writing and playing; have filmed some great videos; and have reached as wide and diverse an audience as possible. We would really love to do a world tour and meet some of the people who have been following us on social media, like Twitter. However, we all love Glastonbury! We all watch it every year on TV and Stu and Charlie were lucky enough to attend in 2012 when bands like Haim, Mumford and Sons and Ben Howard were playing. Stu: When we’re not doing music, we all have full-time jobs so let’s hope we can stick with music! Stu: We’re all big fans of Top Gear and we have been told by some of our followers that our songs are enjoyable to listen to whilst driving. Charlie and Rog are also really into their football, so Match of the Day would be another strong contender. Otherwise, it would be brilliant to hear our music in a Quentin Tarantino film! This entry was posted in Uncategorized and tagged acoustic guitar, Charlie, Rog, Stu. Bookmark the permalink. Paddy Clegg is ready for the crowds and lights where he will be singing his own tracks to everyone! Be sure to be following this up and coming musician! If you add 5 and 12 together that will amount to my age! In my opinion I think my musical genre is a mixture of things. However, if I had to name them, I’d probably say Acoustic/Pop/Skiffle/Alternative all mixed into one! I picked up my first guitar at around about the age of 8 learning my basic chords up until about the age of 12. I then parted with my guitar for a couple of years and started to play drums, jamming with friends and forming a band. Due to school work and other commitments, the band I played drums for fizzled out and parted. Once I turned 16, I finally picked up the courage to sing in front of people and I began to record multiple covers of some of my favourite songs and uploaded them on to Soundcloud. This went on to having a great response from people and I was receiving feedback I’d never imagine I’d ever get as I wasn’t the most confident person with my voice. So, with people liking the covers, I began to write/compose my own songs and went on to releasing my first ever single “Back to the Start”. From a young age I’ve always been highly interested in playing and listening to music. My dad always had guitars knocking about in the house when I was younger as he used to play himself, so I felt like I needed to have a go myself. Yes, I am currently under Twin City Records / Fly on the Wall Records. The La’s, Hudson Taylor, Newton Faulkner, Jake Bugg and Mumford & Sons. I will be releasing my new single “Let’s Get By” early December 2014. With me, I tend to concentrate on the musical aspects of things before I pick a subject to base lyrics on. However, I like to write things about every day life that others can relate to and feel a connection. I’d absolutely love to play Glastonbury Festival (England). However, going over to the states (USA) would be a dream come true for me! My goal is to play as many places/countries as possible and show my music to the world! I’d love to perform with Newton Faulkner that would be unbelievable! Dave Grohl is another musician I’d love to jam with! Hopefully, doing what I’m doing now! Making music, having a laugh and gigging in front of fans, as that’s what I love to do! Probably listening to music and wondering why I wasn’t making/producing music! The 1975, John Newman, Jake Bugg, Hudson Taylor, Catfish & The Bottlemen & many many many more!!! This entry was posted in Uncategorized and tagged Interview, Music, paddyclegg, Solo Artist. Bookmark the permalink. EXCLUSIVE: Hard Road to Fame: Blonde Electra May have been first to go on X Factor Live shows but this isn’t the hardest time they’ve been through but none of that is stopping the bubbly Duo conquering their dreams. Jazzy: Despite our crazy accents, we are a British duo consisting of 2 sisters. We grew up in a religious sect/cult founded by our father. Due to our strict upbringing, we both left home at ages 12 and 14 and started performing in nightclubs as a way to vent and feel liberated”. Ruby: Jazzy is the most amazing big sister anyone could ever have. I screw up all the time and she never judges me. I love her so much. She’s also fearless. We’ve gone through so many scary situations together (especially when we were on our own at ages 12 and 14, working in nightclubs). She has always done her best to protect me from harm’s way. Even though I don’t have any contact to any of my family members, that’s OK because Jazzy is all I need. Jazzy: We wanted a name that would represent who we are and what we stand for. When we think of Blonde Electra. We imagine a strong, independent woman that doesn’t take no for an answer. We both have strong points vocally. Ruby says “Jazzy can belt notes like it’s nobody’s business. Jazzy adds: but Ruby is very talented in finding harmony arrangements. She brings the soul vocally”. Ruby: We both can play E and acoustic guitar and are currently learning to DJ”. Jazzy: Even though our parents forbade us to listen to music as kids, music has always been a part of our lives. We live and we love because of music. Ruby: The first time we were introduced to music was actually by accident. We were passing through Hungary on our way to Ukraine. Our parents stopped at a gas station. Inside, the TV was playing the music video Earth Song by Michael Jackson. I only remember seeing a few seconds of it because our parents quickly covered our eyes because to them, worldly music is evil. But I remember how the music video made me feel. Angry, because I loved it. Angry, because this was something incredible and I couldn’t believe we weren’t allowed to watch it. Even though I was only 8, I knew my parents were wrong about “worldly music”. Jazzy: As soon as freaking possible! We are currently writing our album. We can’t wait for you all to hear it! Ruby: Hopefully signed to a major record label. Touring throughout the UK and in other continents. Ruby: To be honest, G.A.Y has been our No.1 place to perform in the UK. When we got the call yesterday that we’re performing there next Saturday. We literally did a victory dance in our kitchen. Excited as Hell!! If you could do collaboration with anyone in the USA who would it be? Jazzy: Easy Calvin Harris. What a talented hotties. Such an amazing songwriter and producer! We heart Calvin!! Ruby: LOL crying our eyes out! Music will always be a part of us. Jazzy: We’d love our music to be aired in The Avengers, 50shades of Grey, The Fantastic 4 and of course, the new Hunger Games!! What was the best thing of the whole X Factor experience? Ruby: We think the best part was when Brian Friedman told us the ideas he had for Kids in America. I don’t think he knows how liberated we felt. We know it was a huge risk for him and that’s why we are forever indebted to him. He’s a wonderful, talented guy. We love you Brian and we hope to see you soon”. Jazzy: In 2010 Ruby and I went to a rock festival in Germany called Rock Am Ring. Limp Bizkit performed our favourite song by Rage against the machine called Killing In The Name Of. OMG what a performance!! Jazzy: Haha we have many. I absolutely love Justin Bieber and Jared Leto! What’s next for Blonde Electra? Jazzy: Our tour starts Saturday! Starting in G.A.Y. We hope to tour around the whole of the UK. We absolutely love it here! Ruby “Yes we do! You can find us on Twitter, Facebook, and Instagram. X Factor Live Show , This is not the END for this Duo so be surerre you are Following these girls! This entry was posted in Uncategorized and tagged Blonde Electra, duo, Interview, Jazzy, Music, Ruby. Bookmark the permalink. 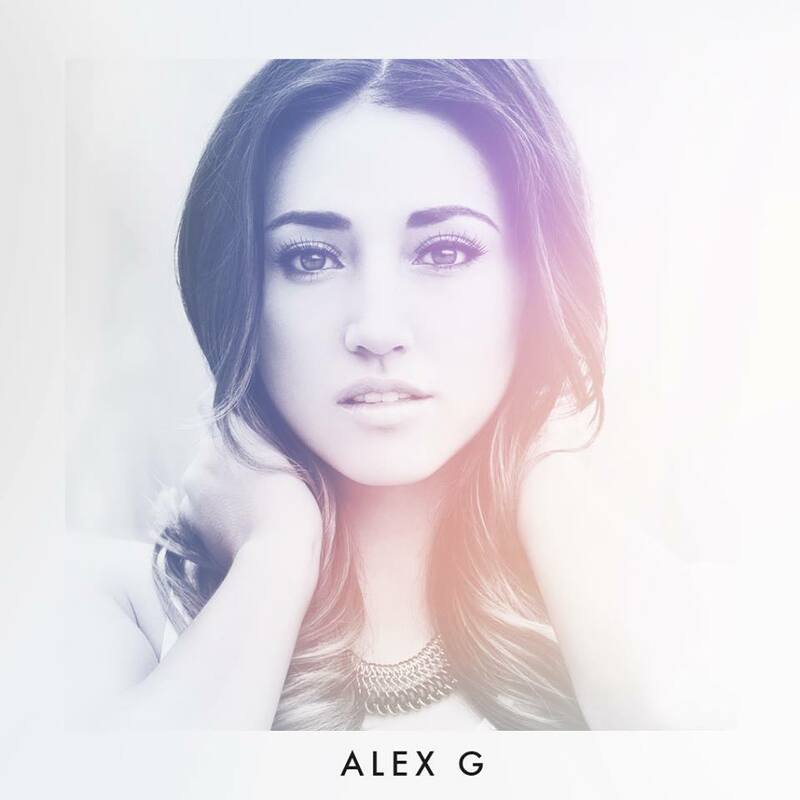 Alex G is a Singer/Songwriter all the way from Colorado, USA, With a Genre of Pop and unsigned. With a HUGE fan base already, I think it’s safe to say that this is a singer to watch for because she’s going GLOBAL! Starting with the track ‘Butterflies’ which has a slow beat, and great harmonies throughout. Still with the slow ish beat ‘Bones’ is the next track of the album but still a very catchy and you could listen to over and over. ‘#LittleMissPerfect’ an upbeat track which seems a lot more personal but has a great edge with the guitar strums and drum beat. Also the video has a vintage look which I think goes fantastic with the track. Instead of reading what I think now I think you need to get out there buy it and have it on repeat because words can’t really describe fantastic music through words so go buy it and don’t forget to tell everyone how brilliant it is. My favourite track off the Album has to be ‘Make A Move’ its sang with so much passion and having a great beat which gets you in the mood to get up and do something. A Summer Album but not always, I think this is an album to listen to when you are getting ready to go out with friends or at a BBQ, id have this on REPEAT! All the songs being personal experience to Alex, it tells the story of her and when you listen you can hear its coming from the heart. This is an album to buy and tell you friends! A 5 Piece from Edinburgh , These Lads are ready to get their Indie/Rock/Alternative Music genre heard by the world… GET TO KNOW ‘ THE INDOS’ in an interview with me. What are your Full names and ages (you don’t have to answer if you don’t want to for ages) ? Mikey: We are from North Edinburgh. We met and started playing at a young age, with the current line up from November 2013,our main influences are anything you can shake your booty to. Mikey: The band originated when Michael, Dando and Robbie started jamming in Jamies bedroom. Eventually they managed to get a quality drummer on board. Jamie realized that if they were all there anyway then he may as well join in and the Indos were born. Greg: We met through a mutual friend called Treadfast Johnson and became friends through our mutual love for guitar music. Where would your dream place to perform be? Storage wars or Deadliest catch if it was a film… (some discussion amongst the band) Total Recall, the original with Arnie! This entry was posted in Uncategorized and tagged Band, Intevriew, the Indos. Bookmark the permalink. Canadian Duo Jamie April and Jason Moon Moved to the UK to Showcase their Music and living a dream performing. We got the name of our group from our surnames – Jaime April and Jason Moon. People think there’s some kind of deeper meaning to APRIL MOON, but that’s it I’m afraid. Lack of imagination gave us our name! When people ask us how to describe our music, we always answer “cosmic pub rock”. I think it sums us up in a way. Our favourite thing to do on any night off is to visit pubs with live entertainment and just take it in – whatever the style, folk, blues, tribute acts, classic rock covers, it doesn’t matter. We feel that our recorded music has been greatly influenced by the live pub scene and you can hear that in the tracks on “The Sun, the Moon, and the Truth”. There’s folk in there, and blues and pop as well. Plus something that Jaime calls gypsy music, whatever that is! Well, we’re from Canada, we met as actors doing Shakespeare plays and dinner theatres. We used to jam at cast parties with all the other actors that could string a few chords together, and then we started getting paying gigs. Turns out that you can make more in one month as a starving musician than you can make in a year as a starving actor, so we made the career switch and came over to England to do our writing and recording. Then we fell in love with the place and never left. On stage we both play guitar. I sing lead vocal, and Jaime does harmonies. In the studio I play drums, guitar, bass, and keyboards, while Jaime plays guitar and all kinds of crazy percussion instruments – many of which she makes herself. I seem to recall a wine bottle filled with macaroni at one point! We both write the songs, usually separately, though sometimes we’ll collaborate – one writing the music and the other the lyrics, etc. We have a very cool process. For Jaime’s tunes, she will usually bring me a song that she’s been working on, with a page of lyrics, and she’ll play it for me. Then I’ll try to play it a couple of times, and we’ll record a quick version of it on one of our phones. Then we leave it alone for a few days so that it can get itself into our heads. My songs on the other hand are usually dreamed in their entirety while I’m asleep. I wake up with the whole song so I have to get up even if it’s 4 in the morning and record it otherwise it will be gone the way of all dreams. They’re probably all stolen from somewhere – how else do you explain it? No, who in their right minds would sign US? If we’re going to make a living doing music, the opportunities will have to be provided by us I’m afraid. Actually, I think I prefer it that way, but never say never I suppose. We both love the Beatles, Crosby Stills Nash and Young, Bowie, Queen, The Doors, The Kinks, The Stones. I think our favourite band is Fleetwood Mac – all the versions of it that include Christine McVie anyway. I like Peter Green alright but Christine is like a songwriting goddess or something. Stevie and Lindsay aren’t bad either! I started playing drums in school when I was 14. It’s still my favourite instrument to play. There’s a video on YouTube showing me recording a drum track for one of our songs in the studio, and I’m clearly having the time of my life. I switched to guitar because I learned the chords to “Ballad Of John and Yoko” for some reason, and I loved the idea that I could sit and play a song all by myself – as a drummer you always need people to jam with, but I could do THIS on my own. Jaime studied piano, trumpet, and learned singing and dancing in musical theatre, but she became a guitar player a few years ago when she was on her way to live in China for a couple years. She learned a few chords before she went so she’d have something to amuse herself over there. When she came back, she was really quite good! When will you be releasing new material? Our album, “The Sun, the Moon, and the Truth” came out on July 22, 2014. We perform about nine of the eleven tracks live and we have written quite a few songs for a new album. We aren’t playing them live yet, but very soon we will be trying out the new stuff. Well, for this album I think we were inspired just by being here, in this country, among these amazing people in the North West. Everything about living here – the air, the green leaves, the constant music everywhere, the buildings – all of it is a source of constant inspiration. I love Canada as the place where I’m from, but I love the UK as the place I want to be for the rest of my life. It was all such a change for us – coming here to live – that I think the songs just flowed out of us. Jaime wrote one called “Southport” after we’d been here just a few days. It’s about the idea of seeing everything anew and re-inventing yourself in a place that previously you had only read about or looked at pictures of. The idea of being part of a great adventure shows up in a lot of our songs. We will still be playing and recording I think. More people will know who we are, just because we constantly travel and play live, and I can’t see that changing. We would like to do a U.S. tour someday – we’ve toured in Europe and Canada, but never the U.S. That would be sweet. I don’t know, we’re very happy right now. If we’re this happy in a few years then I can’t ask for any more than that. Wembley of course. Anyone who says they don’t want to play Wembley is a dirty liar. A dirty liar! I’d be too scared to collaborate with any of my idols. What if I farted in front of them or something? There’d be nothing left to do but crawl into a closet and wait to die! Seriously, I’d want to collaborate with the best musicians in the UK that you haven’t heard of yet. People like Adrian Gautrey, the best guitarist and pedal steel player I’ve ever heard. Actually we already collaborated with him – he’s on two tracks on the album! But I would work with him again, anytime, anywhere. Also Sinead Savage, an Irish singer that we love and are friends with. There are Liverpool musicians like Paul Kappa and Paul Everett and those guys from the band The Real People – it would be an honor to record with any of those folks. I would be famous for my chicken wing recipe. Seriously, it’s the best thing in the world. If music doesn’t pan out, I’ve always got my chicken wings. Jaime says she would live in the forest with her pet moose. I know it sounds like she’s joking, but I’ve seen her out in the forest with twigs in her hair, climbing trees. She looked very much at home to me, so I’m not ruling it out. Actually some of my music has already been used in films – there’s a 2014 film called “Mohawk Midnight Runners” that I scored that is currently making the rounds of the film festival circuit in North America. But if we’re talking about APRIL MOON music, it definitely should have been on “Sons Of Anarchy”, but that show is winding up this season so we’re too late. If Quentin Tarantino asked us to use some of our music I wouldn’t say no. His films have the best music, hands down. 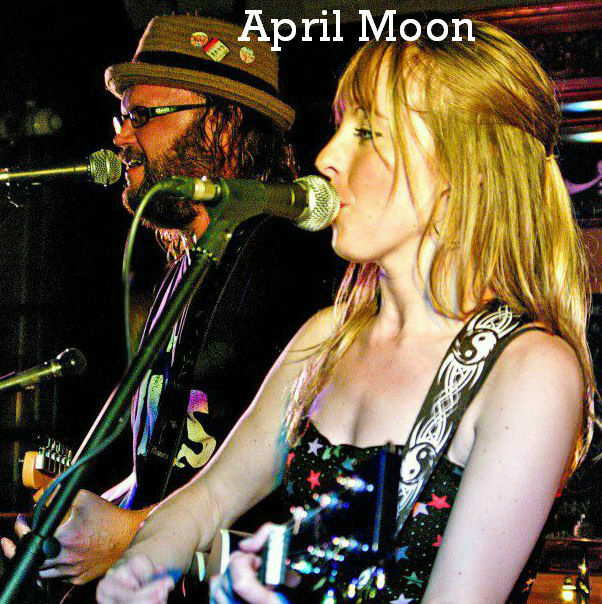 People can find us at www.aprilmoonband.com and on facebook of course. Our YouTube channel has videos of lots of the things we talked about today – even Jaime climbing one of those trees! Check it out folks! You won’t be disappointed. This entry was posted in Uncategorized and tagged Canada, Jaime April, Jason Moon. Bookmark the permalink. 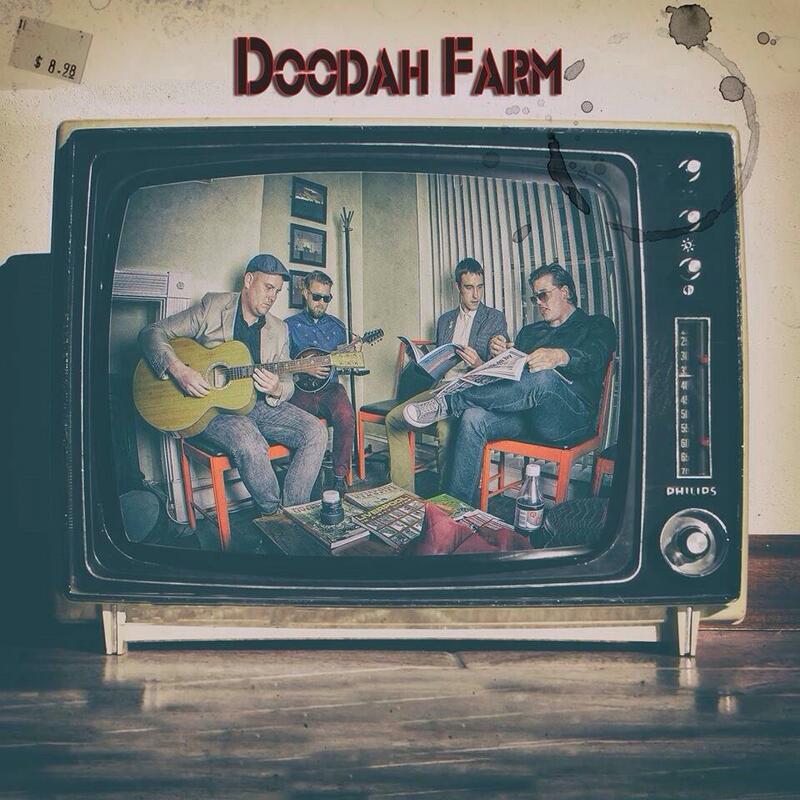 Doodah Farm have give me the chance to take a sneak peak listen to their two new tracks and ill tell you something you’re in for a treat! The Double A-Sided Single from the Liverpool band ‘Doodah Farm’, giving their fans an extra track which w has been a great idea. ‘OiOi’ is the first track which starts off with the band shouting ‘OiOi’ with a great drum beat and guitar strums then kicks in with the track being upbeat and the rhythm is fast but so are the vocals which makes it very catchy and flows great throughout the track. ‘Soft Lad’ starts off a bit slower but get in to the rockabilly genre throughout, with guitars and drums in the backing track. Another upbeat and catchy track putting. This is a band to watch out for, they are vocally great and their song writing skills are incredible. Make sure you are following these lads! This entry was posted in Uncategorized and tagged doodahfarm, Music, Review. Bookmark the permalink. what a fantastically written and produced song with a fun video! Great rusky pop/indie beat with his rusky voice which gives Callum the unique edge in the music industry with the tone Callum has .With a great backing track which gives the song a great edge to it and make it catchy and listen to the meaning of it too. This is a hit! The lyrics are brilliant and the it all fits to a chart topping track. I would rate this 10/10. This entry was posted in Uncategorized and tagged Callum, Song Review Callum. Bookmark the permalink. Lucy Alexandra Sardinha is a up and coming singer/songwriter that has passion for music and is ready to get her own heard. I like to describe my style as a crossover of Country, Soul and Pop. I take elements of my three favourite genres and put them together to create my sound. I was born and raised in Essex, UK. I’ve loved performing for as long as I can remember, and never have I considered doing anything else with my life. When I’m not writing songs or performing, I can usually be found at the gym or playing old videos games (nothing that was released post 2005). On a weekend, I teach singing to youngsters at a small performing arts school in Southgate that started me on my path. It’s probably the most rewarding and gratifying thing I do with my time. I have an unhealthy obsession with self-serve frozen yoghurt, pic’n’mix and Marvel movies. I fan-girled like crazy this year when McBusted was formed. My motto is you can never have too many sparkles. I’ve been singing since I learned how to speak. I wouldn’t be surprised to learn that my neighbours hate me for it. I started playing around with writing songs about 5 years ago, and in the last couple of years I’ve continued writing, as well as producing my own tracks for what I write. My family have always been involved in the music industry in one way or another, so I think it was inevitable. Honestly I’ve never seriously considered doing anything else. This is my life. I play piano and guitar. I desperately want to invest in, and learn to play, slide guitar. No. 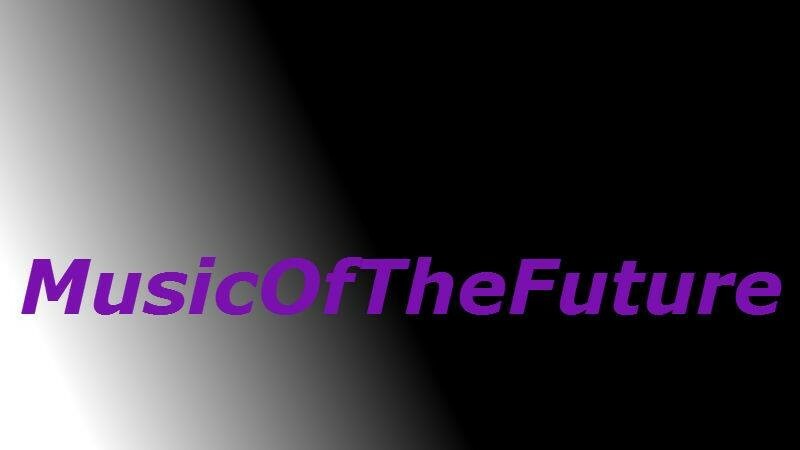 With the way social media has developed the music industry, I’d like to see how well I can do without signing to a major label. For me, it’s all about the fans. Unless you have that support, all the money pumped into you in the world from a big corporation is a waste. I was always heavily influenced by older soul artists like Etta James and Dorothy Moore. I love the raw emotion you always found in their vocals. Michael Jackson has also always been with me, and I cite him as probably my biggest influence to date. More recent artists that I’ve drawn inspiration from include Carrie Underwood, Paloma Faith and McFly. I’m currently working on my debut album which I hope to release later this year. In the mean time I’ll be releasing teasers of some of the songs from the album and definitely a few more covers. Inspiration for my songs can literally hit me at any time. I’ll get a sudden phrase or lyric idea in my head when I’m waiting for a train or out with my friends and have to stop whatever I’m doing and write it down. From there I’ll work on the music to base the idea on, and see how it develops. Nothing can ever beat getting back to basics though. When it’s just me in a room with my guitar and a notebook, that’s when I get the best out of myself. Right now, I’d love to duet with Brad Paisley. I’m absolutely in love with his voice. Otherwise, it would have to be Katy Perry. Her shows are always so visual and full of colour and whimsy. That’s all what I’m about. Can I say winning the Grammy for Artist of the Year? Only kidding, although that would be nice :-). Honestly I just want to be able to make a living doing what I love. I suppose that’s everybody’s ultimate aim. But I also want to inspire people. To be, in 5 years, the person people in my current position look up to and strive towards would be such an honour and achievement. That’s a really tough question. I listen to so many different artists it’s hard to pick just one. I really love Paloma Faith’s new album. But I’d have to say currently I LOVE Sam Smith. I think he’s so unbelievably talented and different. It’s refreshing to hear. Again it would probably be Katy Perry, even if just for the amazing costumes and sets I’d get to see and use! It would definitely be McFly. I’ve grown up loving those boys and to this day they still seem to have so much fun and love what they are doing. I can tell it would be a laugh a minute! I also would love to collaborate on songs with them, they’re so talented. Do you have a website or social media pages for fans to follow you? 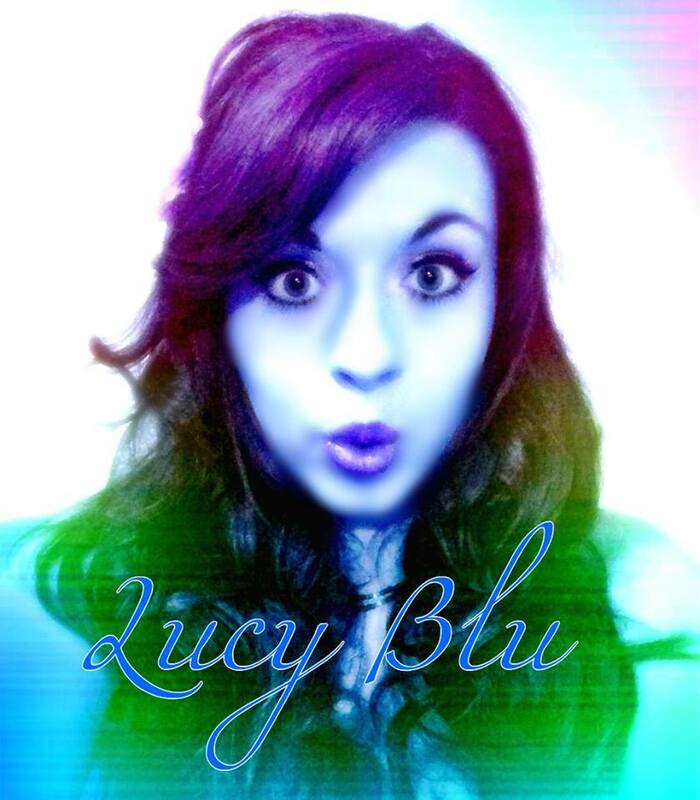 This entry was posted in Uncategorized and tagged Interview, Lucy Blu, singer, Solo Artist, songwriter. Bookmark the permalink.